I created this dish with a certain group of people in mind. 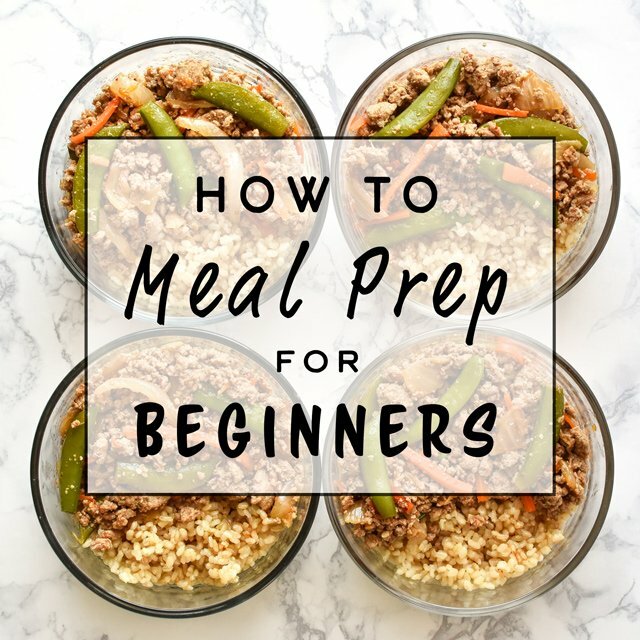 Lately I’ve been seeing requests in some meal prep Facebook groups for meal prep recipes that serve more than four servings. I saw a woman write that she has six people in her house and four serving meal prep recipes just don’t work for her family (I’m assuming there were two grown adults with at least a couple teenagers in the house). This request makes sense, and it’s a reality I haven’t thought about too much until now. It’s not always clear what recipes make good leftovers, or what recipes are easy to double. Feeding more people is always going take more effort. 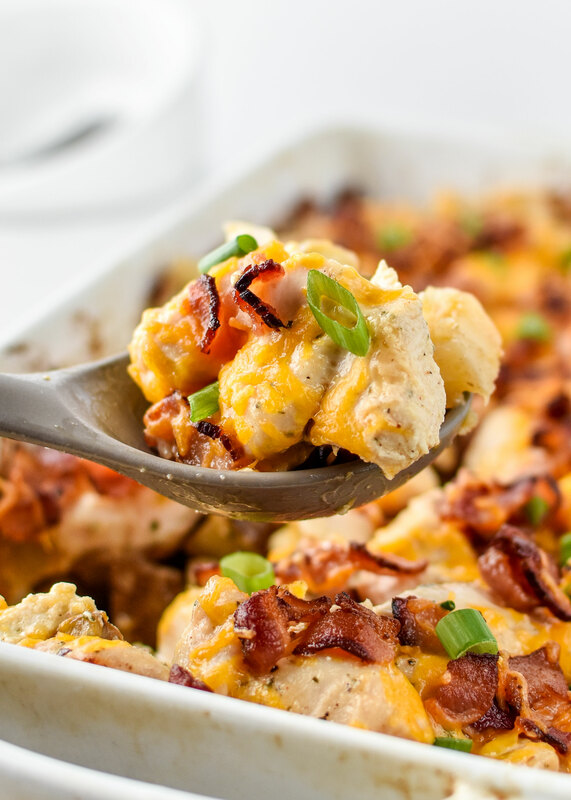 That’s where this Chicken Bacon Ranch Potato Bake comes in. This dish makes eight hearty servings, enough for a hungry family of six with a serving or two of leftovers for lunch. If you are not a family of six, then you’re going to be set for lunch the entire week. I’ll cook a meal like this on Sunday for dinner, and there will be 5-6 portions leftover. This sounds like a lot, but with two people, it ends up being about 3 lunches each for the week. Turns out, I’m a big fan of leftovers!! Of course, you already knew that! What equipment do you need to make this dish? 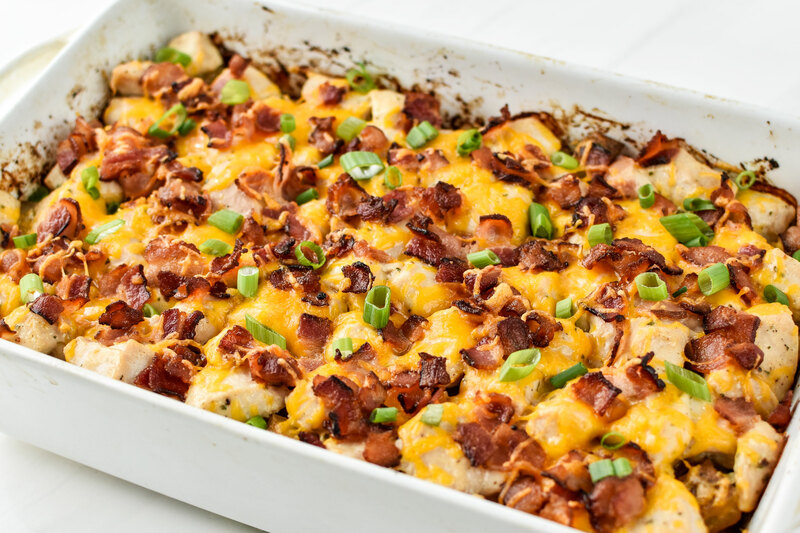 The most important thing you need to make this meal is a 9×13 casserole dish! This will not fit in anything smaller. I don’t have any particularly strong recommendations, but glass or ceramic dishes are what I use. Anything that can stand up to a little broiling is always good to have. 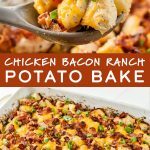 How do you make this chicken bacon ranch potato bake? Preheat the oven to 425F degrees. Start with some good old russet potatoes, medium in size, about 3 pounds (yes, this is a large dish). 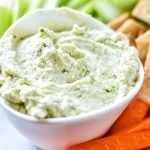 Chop them into bite sized pieces, no larger than 1 inch, and add them to a large mixing bowl. Add oil, hot sauce, ranch powder, garlic powder, salt and pepper, then mix until all the potatoes are evenly coated. Next, use a slotted spoon to place the seasoned potatoes from the large mixing bowl into the casserole dish. DON’T DUMP THEM – you want to leave any oil that has collected in the bowl there for the chicken! Save the potato bowl! Roast these potatoes in the preheated oven for 45 minutes total, but stirring every 15 minutes so the potatoes cook evenly. Once the potatoes are in the oven, get the chicken out. Cut the chicken breasts into 1 inch chunks (about the same size as your potatoes), and toss them in the potato mixing bowl. Once all the chicken is cut, toss in the remaining Ranch from the packet and stir it up. You should not need to add any additional oil or salt and pepper, since there was plenty remaining from the potatoes. Let the chicken sit out in the bowl while the potatoes continue to cook. After 45 minutes in the oven, the potatoes should be fork tender, but not completely cooked (top left photo in the grid below). At this point, grab your bacon bits, cheese, and marinating chicken. 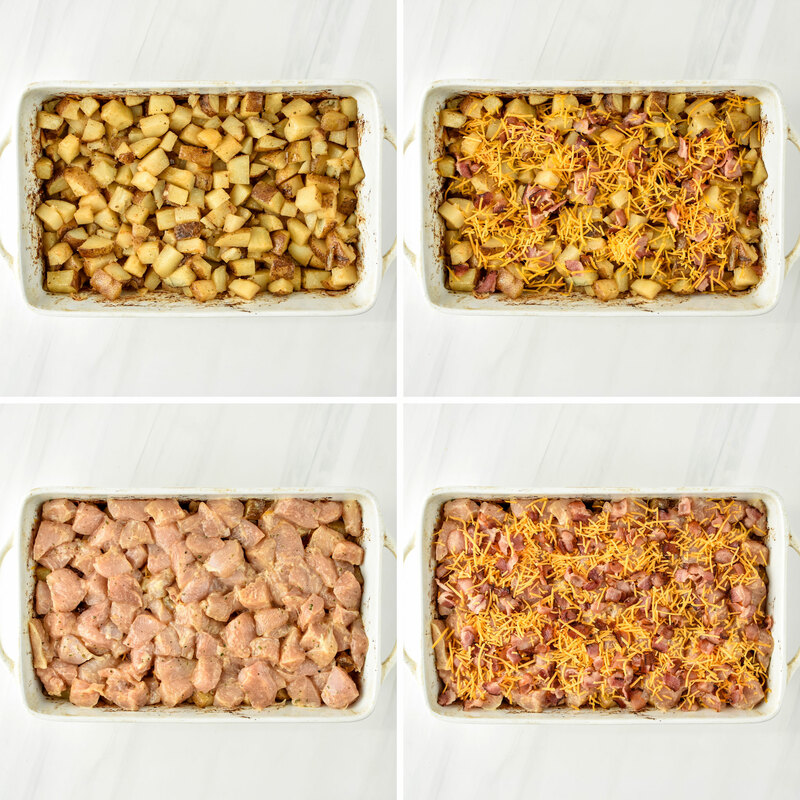 Stir the potatoes, then add a layer of bacon bits (about 2/3 of them), followed by about 1/2 cup of cheese (top right photo). On top of this, add ALL of the raw chicken, in as much of a single layer as possible (bottom left photo). On top of the chicken, add the remaining bits of bacon and the rest of the cheese (bottom right photo). Bake in the 425F degree oven for 15-20 minutes, until the chicken is completely cooked through and all the cheese is melty. You can either choose to go quick and simple by purchasing pre-made bacon bits at the store, OR, you can get fancy and make your own bacon bits at home. Using premade bacon bits also keeps this recipe down to one pan. So which should you choose? I’m not gonna lie, using store-bought is easier, but making homemade bacon bits give you control over what kind of bacon the bits are made from. 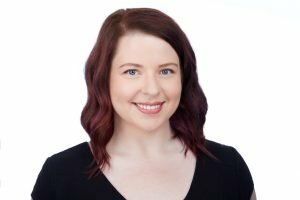 Making my own bacon bits at home at my jam; here’s why. 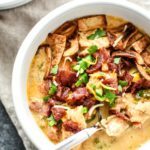 I prefer to use the best bacon I can get my hands on, and that my friends, is ButcherBox bacon (affiliate link!). The bacon is completely sugar free, which most bacon from the store is not. The bacon is also organic, comes from sustainably and humanely raised animals, and you can legit taste the quality. No preservatives, hormones, nitrates or nitrites either. It’s good stuff. To make my own bacon bits, I open a full package of bacon (ones from ButcherBox are 10 ounces I believe) and simply use a sharp knife to cut the bacon into little pieces. 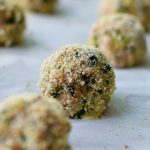 The bits don’t even have to be as small as store-bought – they will be tasty either way! 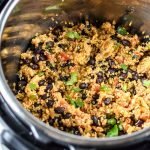 I heat up my Dutch oven and then toss all the bits in at once. Using a wooden spoon or spatula, you can cook all the bacon bits in one batch until they’re browned and crispy to your liking. Remove the bacon bits, set them aside in a paper towel lined bowl and save the rendered bacon fat for another dish. What’s the difference between a bake and a casserole? This is just my uneducated opinion! And what I think of when I hear the words ‘casserole’ vs. ‘bake’. Casserole: I picture something made in a casserole dish (perhaps where the name casserole dish is from? ); it’s creamy or saucy, there’s meat and veggies, maybe noodles or rice, and always cheese. To me, this is a more specific food item than something named “Bake”. I don’t call this recipe a casserole because it’s not creamy. I know it fits the other criteria, but it’s just not quite what I think of when I hear the word casserole. Think tuna casserole, chicken & rice casserole, stuff like that. Bake: This could pretty much be anything made in an oven that doesn’t have a better name already assigned to it (such as casserole or pot roast). Think of the verb ‘bake’, but in noun form. Have you heard of a chicken bake from Costco? That counts. This recipes counts. If you can’t think of a better name, bake totally counts! How long does this meal last after cooked? 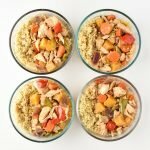 In the fridge: Store in an airtight container and enjoy within 4 days of cooking. In the freezer: Cooked potatoes do freeze much better than raw potatoes, so I do think this recipe would freeze in airtight containers for up to 1 month. Please note I have not tested this recipe in the freezer. 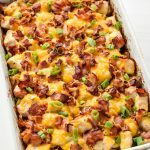 Feed a crowd or have yummy leftovers for the week’s lunches with this Chicken Bacon Ranch Potato Bake! 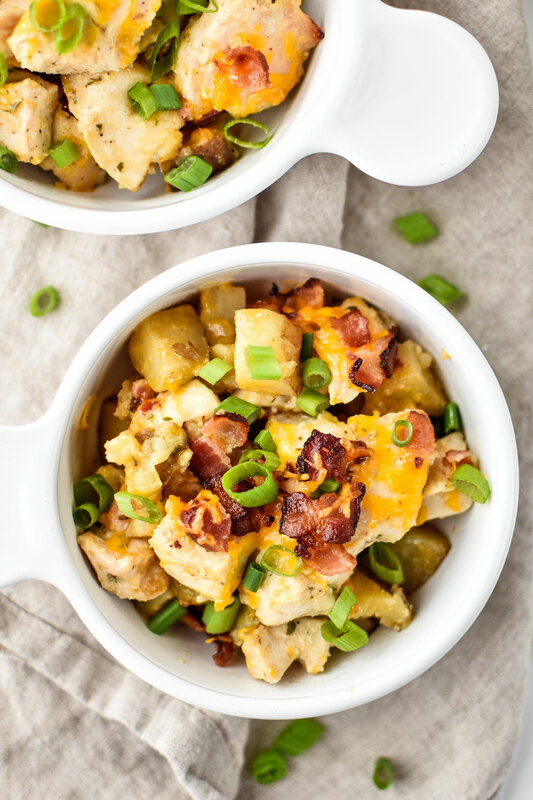 This hearty main dish is baked in one pan and loaded with bacon & chunky ranch flavored chicken breast all over roasted potatoes! Bake those potatoes: Preheat oven to 425F. 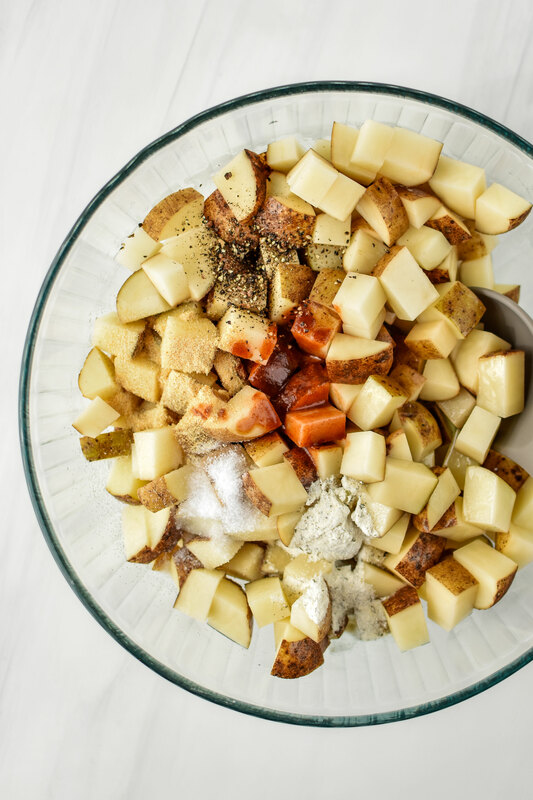 Add the potato chunks to a large mixing bowl, then add oil, hot sauce, garlic powder, 1 tablespoon of the Ranch seasoning packet, salt, and pepper to the bowl. Mix well until oil and seasonings are evenly distributed. 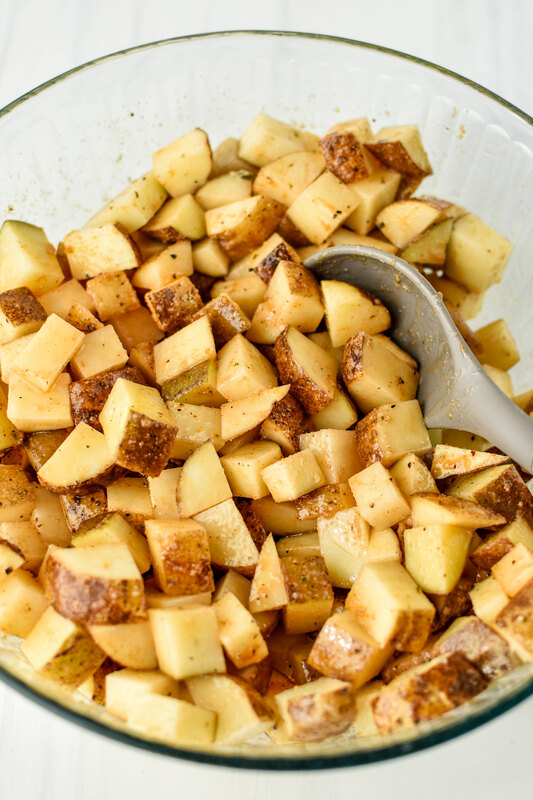 Using a slotted spoon (don’t pour them in), add the potatoes to a 9×13 inch casserole dish. Save the bowl and leave any oil/seasonings that have collected in the bowl there for the chicken. 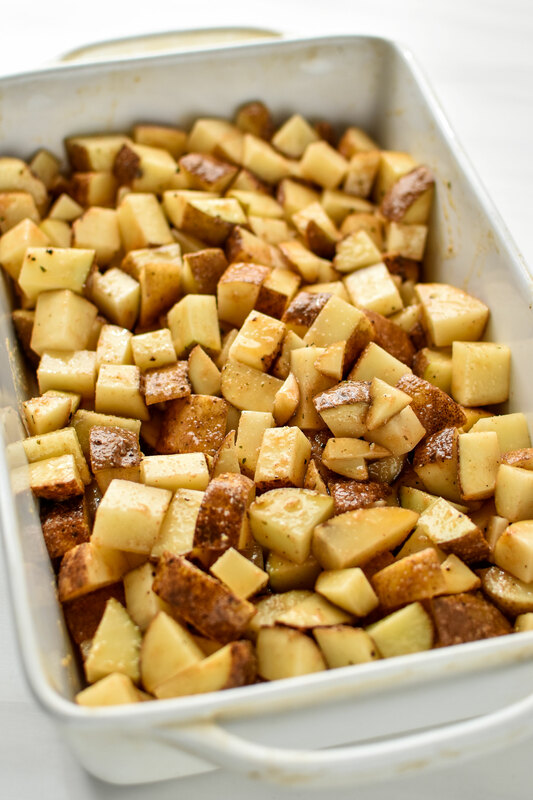 Roast these potatoes in the preheated oven for 45 minutes total, stirring every 15 minutes so the potatoes cook evenly. Prepare the chicken: Cut chicken into 1 inch chunks if not already done, then add to the same bowl the potatoes were mixed in. Add the remainder of the Ranch seasoning packet to the chicken and stir until well mixed and chicken is coated in oil from the bowl. Set aside until the potatoes have cooked for 45 minutes. Put it together: After the potatoes have cooked for 45 minutes, remove the dish from the oven and give the potatoes a final stir. Add a layer of bacon bits (about 2/3 of them) on top of the potatoes, followed by about 1/2 cup of cheese. Next, add ALL of the raw chicken to the casserole dish, in as much of a single layer as possible. On top of the chicken, add the remaining bits of bacon and the rest of the cheese. Bake in the 425F degree oven for 15-20 minutes, until the chicken is completely cooked through and all the cheese is melty. 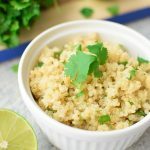 Serve with salad or a side veggie if preferred. Store in an airtight and enjoy within 4 days. For a 4 serving meal, cut recipe in half and bake for the same amount of time in an 8×8 baking dish. Nutritional information estimated with My Fitness Pal. 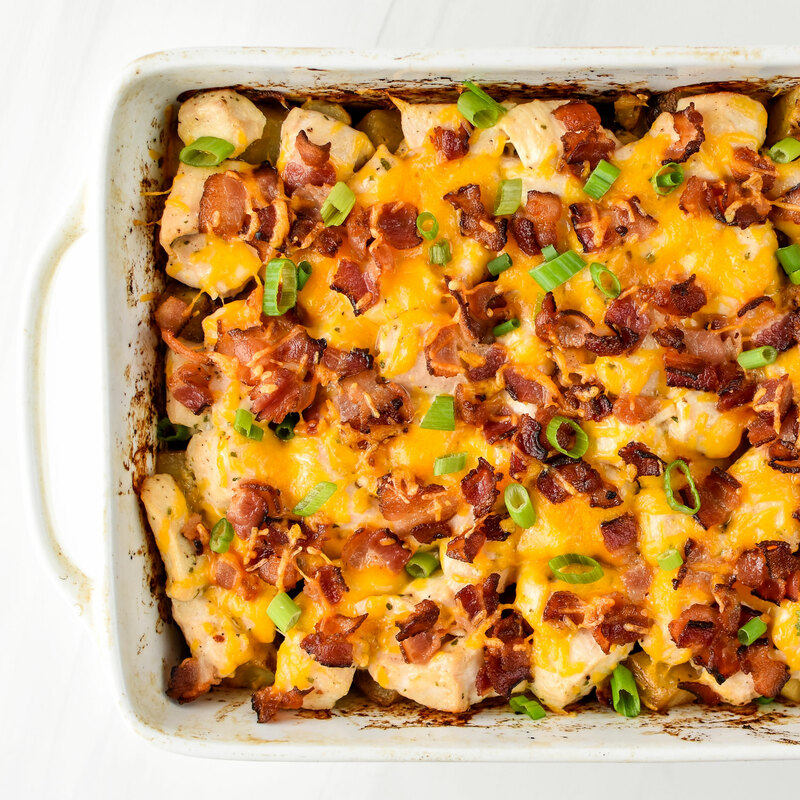 I sincerely hope you and your family enjoy this Chicken Bacon Ranch Potato Bake as much as we do! It’s so nice to have dinner and a huge pile of delicious leftovers for lunches! What do you think? Comment below or tag me on Instagram – @projectmealplan! !